Here at Metal Biz we’ll happily take your old car (or its parts) off your hands and even give you cash for it. But if you’re attached to your car in any way, shape or form you may want to check out these creative ways you can keep it close to your heart – as a piece of home decor. From the practical, to the surprising, these ideas take upcycling to a whole new level. If misplacing your keys is an issue, then this seatbelt key holder is the perfect solution. The buckle end can be hung up on a nail near the front door, and then simply push the button to release your keys and go. Of course, you have to remember to attach them back into the holder when you return though! It’s not every day you see a glove box being used as an art station, but this under-utilised car part actually works brilliantly. Simply secure to the wall using a couple of screws and voilà – a strong, durable storage space to keep your kids art supplies neat and tidy. Did you have a car bed when you were a kid? Well now you can have one as a grown up too. Classic cars, like a Mercedes or a Jaguar, typically make the best adult car beds because they’re a lot more stylish than say the front end of a Toyota Corolla, but whatever floats your boat. If feel your beloved Toyota warrants pride of place in your boudoir, who are we to judge? The industrial look is a popular interior design trend these days, so a glass table top supported by a V8 engine is sure to make a statement. As well as being an eye-catching piece of furniture, it is also multi-functional with room for several bottles of wine in the piston holes. 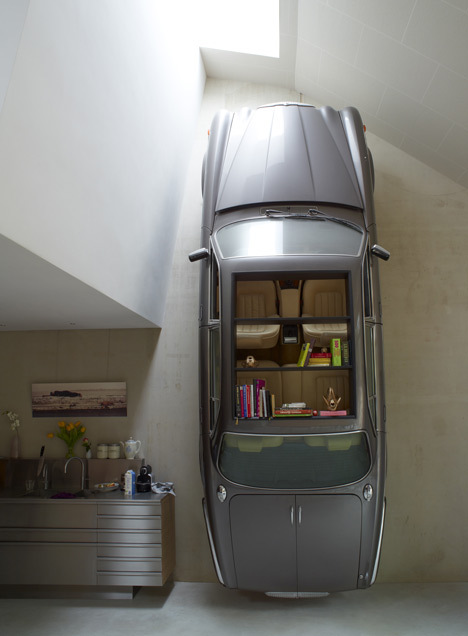 We admit you do have to be a serious car lover to have this in the living room! If you’ve recently bought a new car but can’t bear to get rid of your old one, then turning into a lounge feature could be an option. Yes, that’s right, the whole car turned on its end and attached to a wall. To make it a functional piece of furniture cut out a hole in the roof, add some shelving and you have a nifty bookcase in the passenger cabin, plus a talking point when you throw a party. Again classic cars work well in this scenario, and bringing a furniture designer on board can help make it look a lot more professional. If you don’t have a classic car but something equally as iconic such as an old Falcon, then consider repurposing the bumper into a fish tank. Keep in mind you’ll need a certain amount of space to house this aquatic wonderland, but if you love fish and cars then it makes sense to combine the two. Metal Biz is a Brisbane Cash for Cars and Scrap Metal Recycler. For free quotes for your old, damaged, or worn-out cars, or to sell your scrap metal, visit our website.